So far Nicholas Yu has created 2 blog entries. Stamford, CT – January 7, 2019 – Rizing, LLC, a privately-held multinational company providing leading SAP functional and technical services to its customers, announced today the acquisition of Synchrony Global, an SAP® SuccessFactors® Professional Services Firm headquartered in Singapore, with offices throughout the Asia Pacific region. Synchrony Global is a market leader in Asia Pacific with a focus on SAP SuccessFactors Certified Professionals as well as a strong Business Process Outsourcing service. 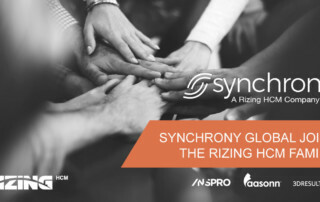 Synchrony joins /N SPRO HCM, Aasonn and 3D Results as part of Rizing’s Human Capital Management (HCM) business, which was recently rebranded as Rizing HCM. The completion of the Synchrony acquisition further strengthens Rizing’s global position in the SAP SuccessFactors Cloud Software services market. The combination of firms provides a robust platform of depth and expertise to service customers and provides the foundation for significant expansion of services, technology and geographies. Rizing’s recent acquisitions of Aasonn and 3D Results created a need to rapidly align on a single go to market approach with its /N SPRO HCM business. Rebranding to Rizing HCM allows the three major SuccessFactors focused organizationsto go to market with one voice and one brand.